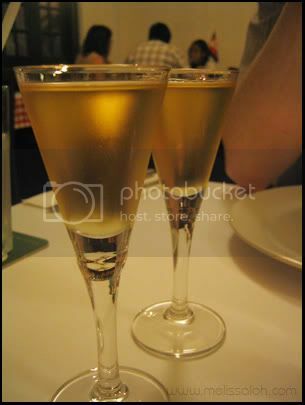 We decided the night before to try Akvavit. The restaurant guide listed it as 'European cuisine' and Scandanavian... and we felt adventurous. The place is just above Fisherman's Wharf and is really homely. The tables are covered with red-checkered tablecloths and a thick white paper. There are 2 sections, which at the time meant the owner's 2 young sons and a friend's older daughter could play without disturbing any of the patrons. The menu board was in Danish and although the friendly owners speak good English, they cannot quite describe the dishes. They limit it to 'beef patty', 'fried pork', 'fish', 'potatoes', etc. You get the idea. 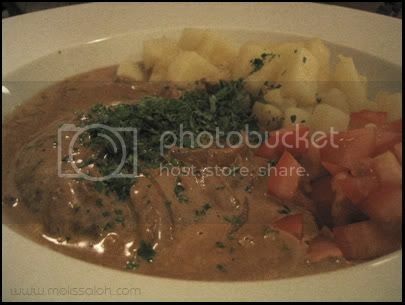 We decided to just go for it, since we had no idea what Danish cuisine is like anyway. 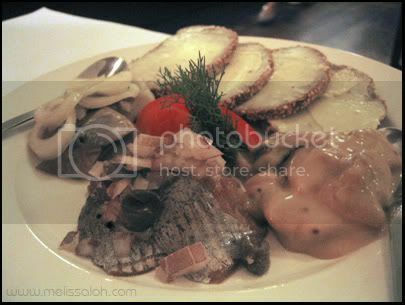 Our starter was the '3 herrings' (S$12.50). This was sooooo good, especially the one in the honey mustard dressing. 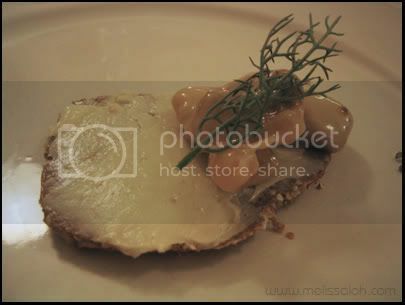 The herring pieces were thick and succulent. I still drool at the thought of that raw fish. tvjames went for the 'beef patty'. But it was nothing like any burger I have ever tasted. The sauce was not mushroom or a wine one, but was so savoury and not too creamy. The cubed potatoes were unsalted and the cubed tomatoes added a freshness in each bite. Crispy bacon lovers beware! 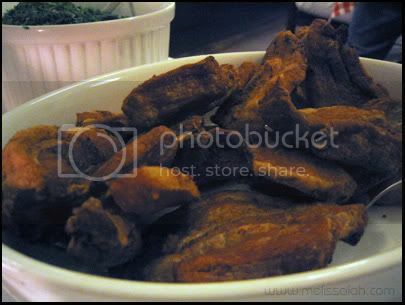 I got the 'fried pork' and 10 of these babies I did get. Each piece was about 8 cm by 4 cm big, and as thick as my fingers. These were fried to absolute crispiness, stopping just before the point of carbonation. This was accompanied by a ceramic soup bowl worth of whipped potato with cream and liberally topped with finely chopped of what must be the mildest parsley ever. We couldn't finish the lot, so the lady boss happily put the leftovers in a doggie bag for us. If you think we just managed to get good dishes, nuh uh baby. There were 2 Danish men with a girlfriend at the next table. The girl got a MOUNTAIN of hot whipped potato, topped with a saucepan fried dressing of assorted thinly chopped meats. One of the guys had a MOUNTAIN of saucepan fried assorted thinly chopped meats, topped with 3 CD -sized eggs done sunny-side up (which he immediately drowned in BBQ sauce and ketchup). And we saw the chef preparing the dessert of strawberry porridge for the next table. As we were about to leave, he was getting ready to whip fresh cream and sugar for the dessert topping. Talk about fresh! I cannot stress how awesome the food turned out to be. bloody hell i'm drooling! i will go there when i go back to singapore. i hope the quality remains consistent! hahahah... i'm sure sydney's got some awesome cuisine too. we overheard the lady owner telling the other patrons that they set up the restaurant, cuz they were jobless here and he was a trained chef.